In 2011 I met up with Kevin Judd in New Zealand and published a little tasting profile of his exciting new project, Greywacke. Winemaker at Cloudy Bay for over two decades, Kevin had launched Greywacke to huge critical acclaim in 2010 as a ‘négociant’ operation, borrowing winery space and using fruit he buys from long-standing friends and associates, all coming from mature vineyards within the centralWairau Plains and the Southern Valleys of Marlborough. In February 2013 Kevin was in the UK, travelling around the country with his importer, Liberty Wines, and I was delighted to meet up with him for lunch and a tasting of his current releases. Two years on and it is status quo for Kevin terms of his business model, with a seven-wine range, still made in facilities borrowed from Dog Point Vineyards and sourcing fruit mainly from vineyards owned by Ivan Sutherland, ex-Cloudy Bay colleague and co-owner of Dog Point. But much else has changed: the phenomenal success of Greywacke has taken Kevin a little by surprise, with demand for the wines outstripping supply, and now selling in 25 different world markets. Photo © Kevin Judd, click it for larger version. Kevin’s Chardonnay has been a runaway success, and has given him the headache of sourcing enough fruit of the right quality. “I even placed ads in the local newspapers,” he tells me, “looking for mature vineyards planted with the Mendoza clone, but there’s just nothing about.” The Mendoza Chardonnay clone is famous for its ‘hen and chicken’ habit of uneven sized berries, but Kevin is 100% convinced of its quality in Marlborough. Like the “Wild” Sauvignon Blanc, it is fermented only with indigenous yeasts, whole bunches being vinified in French oak barrels. My final topic of conversation brought an enjoyable tasting and lunch to a close: photography. Kevin’s evocative photography adorns the labels of his wines, and he is one of the world’s most acclaimed vineyard photographers, his work appearing in many titles including his book ‘The Colour of Wine’, and on kevinjudd.co.nz, dedicated to his parallel career. 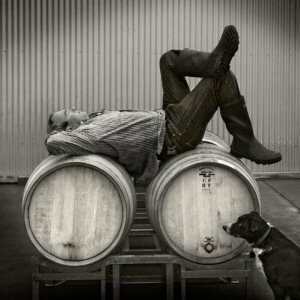 What’s the balance between winemaking and photography now, I asked him: “I’m doing next to no photography,” he tells me with a resigned shrug that makes it clear the double-edged sword of Greywacke’s success has put a hold on that. He instantly grabs his iPhone to show me photographs he has taken in Edinburgh the evening before. That passion still burns as bright, and I suspect Greywacke’s glittering future will still make room for him to get back behind the lens. Greywacke wines are imported into the UK by Liberty Wines (020 7720 5350). See all UK stockists on wine-searcher.com. All of the fruit comes from the Brancott Valley, vines cropped low with medium-sized bunches, though Kevin has clones with smaller bunches coming on stream. Picked very ripe at 25/26 Brix, whole bunches are vinified 50% in barrel with wild yeast, 50% in steel with a neutral yeast, the whole lot blended prior to finishing the ferment in older barrels. With 10g/l of residual sugar and good weight in the mouth, this is a rich perhaps Alsace-style Pinot Gris with lovely aromatics, some delightfully nutty wild yeast character, good weight and definition on the palate too. 90/100. £16.00 at The Wine Society, see all UK stockists on wine-searcher. With 20g/l of residual sugar and 12% ABV, Kevin says this is made the same way as the Pinot Gris, the grapes picked with good acidity, but fruit really ripe from Ivan Sutherland’s organic vineyard on soils washed out from mouth of the valley. Delicate, delicious sweetness suggested on the nose over lime and blossom, and a touch of waxy character. Kevin says a touch of dry botrytis in the grapes at picking. Delicious dry extract character, full of texture and fruit but lovely length and finesse. 91/100. £16.00 at The Wine Society, see all UK stockists on wine-searcher. Sourced from vineyards in and around the Brancott Valley and the central Wairau Plains. Harvested at night to take advantage of cool conditions, most of the juice was pressed straight to steel tanks, but a proportion went into older barriques for fermentation with wild yeasts. Fabulous, luminous stuff, with all the clarity you could hope for, a good dose of Marlborough punchiness, but subtle and relatively elegant too. Long and dry, the acidity shimmering. 92/100. £16.00 at Nickolls & Perks, see all UK stockists on wine-searcher. A re-tasting of the previous year’s release. Kevin selects fruit “towards the riper end of the spectrum,” with 100% uncontrolled wild yeast ferment. He ferments in small barrels because temperature is not controlled during fermentation and volumes are so small. Gorgeous nose, two thirds went through malolactic fermentation which adds to the oily, lanolin and richer character. Delicious mid-palate sensation of sweetness. 92/100. £21.40 at AG Wines, see all UK stockists on wine-searcher. Delicious nose, lots of cream, lots of the wild, clove and earthy character that is so appealing, a streak of pungent pea pod beneath. Bursts with flavour on the palate, fabulous punch and clarity, really tangy, the mango and nectarine ripeness quickly controlled by the cool, mineral acidity. 93/100. £20.95 at Slurp.co.uk, see all UK stockists on wine-searcher. Sourced from vineyards planted with the low-yielding Mendoza Chardonnay clone, grapes were whole bunch pressed before being racked into French oak barriques (25% new) for wild yeast fermentation and a total of 15 months ageing. It has a beautiful nose, with lots of lifted, exotic Sandalwood spice and nuttiness – the oak is there, but there’s a precision to the fruit beneath. It’s a weighty wine in the mouth, a little bit oily with its limpid weight of fruit, but it is cleansed and driven along by rapier-like acidity. 93/100. £21.75 at AG Wines, see all UK stockists on wine-searcher. This wine was one of my top Christmas recommendations. Around 20% whole bunches go into Kevin’s best barrels. Fruit comes from North and Northeast-facing vineyards, lots of different clones, and fermentation is 100% wild yeast. Dark. Morello cherry fruit is deliciously inviting. There’s a raciness and tight floral character, but the palate has cool black fruit, lovely focus and hints of silky textured weight. Long. 91/100. £29.49 at Hailsham Cellars, see all UK stockists on wine-searcher. Two-thirds of the grapes were harvested at 28 Brix, another third at 40+ Brix, to ended up with 36 Brix and 120g/l of residual sugar. Absolutely delicious nose, honey, botrytis, but lovely lime purity too, not masked by the botrytis. Delicious palate too, that purity and vibrancy again and smooth, lanolin texture. Freshening acidity gives a keen edge in the finish. 91/100. £19.00 per 37.5cl at KWM Wines & Spirits, see all UK stockists on wine-searcher. 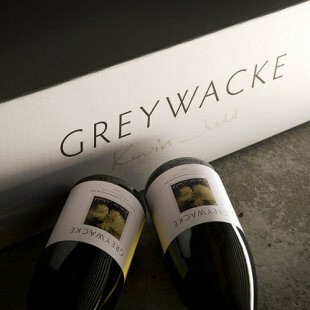 See all Greywacke wines on wine-searcher.